Officials with the Iowa Governor’s Traffic Safety Bureau hope the popularity of those rubber wrist bracelets can launch a new message about the dangers of texting while driving. Unlike the familiar yellow LiveStrong bracelets worn by cancer survivors and other followers of bicycling legend Lance Armstrong, these bands are only big enough to be worn on your thumb. Since most people text with their thumbs, Mulhern says it seems like a natural fit to have these bands sized to be worn on those appendages. He says they’re being passed out at high school and college events and by some Iowa law officers when they catch drivers texting. 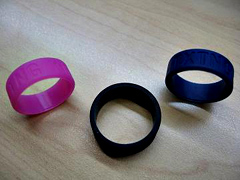 Rubber thumb bands with texting message. Mulhern says, “The whole idea is to not only remind the person wearing them, but because they’re so unique, people will ask them ‘what is that,’ it gives them the chance to tell them ‘it’s no texting and driving,’ so it doubles the message.” The colorful bands are catching on with Iowa teens, he says, and other demographics. Mulhern says, “A lot of parents and grandparents who may not text are wanting the thumb bands also to wear to show that they’re buying into it and to set the example.” Since July, texting while driving has been illegal in Iowa. For now, it only brings a warning. Next July, it’ll be a fine.